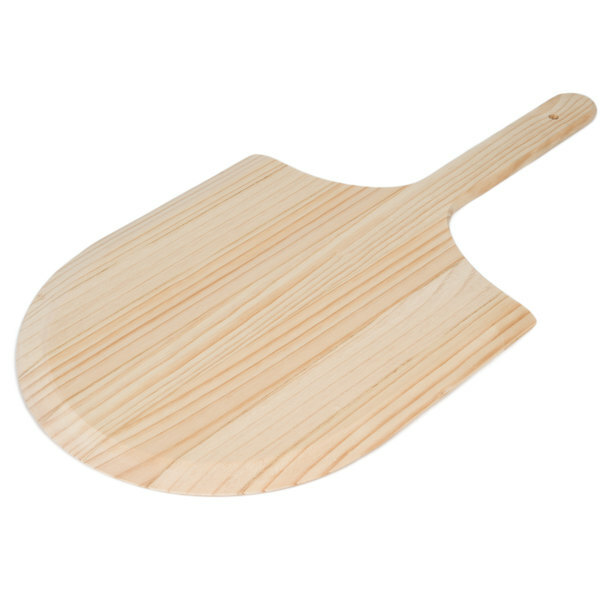 Make it easy to load and unload pizzas from a hot oven with this 12" x 14" wooden pizza peel. 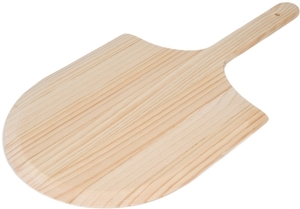 Ensure fast, effective service at your bustling pizzeria with this 12" x 14" wooden pizza peel! 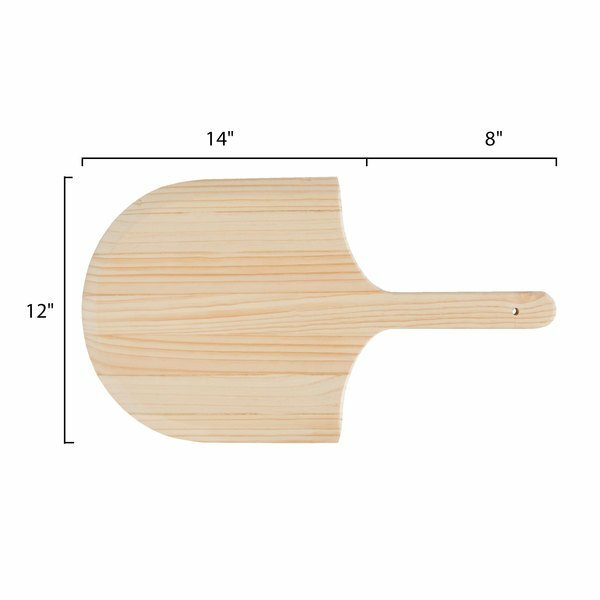 This 1/2" thick wooden peel features a tapered design for easy handling while a short, 8" handle ensures a safe, sturdy grasp in smaller kitchens. 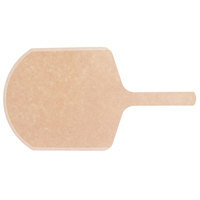 Its blade keeps the peel balanced and makes it easy to maneuver your pies. "I have been using this peel for 2.5 years and it works great. I have made hundreds of pizzas on it at home and it has only warped ever-so-slightly. I just purchased a larger one and it is the same good quality. Great deal." Wooden peels, like this, are superior to steel peels in that they easily slide under a pizza with less risk of causing damage to the pie itself. 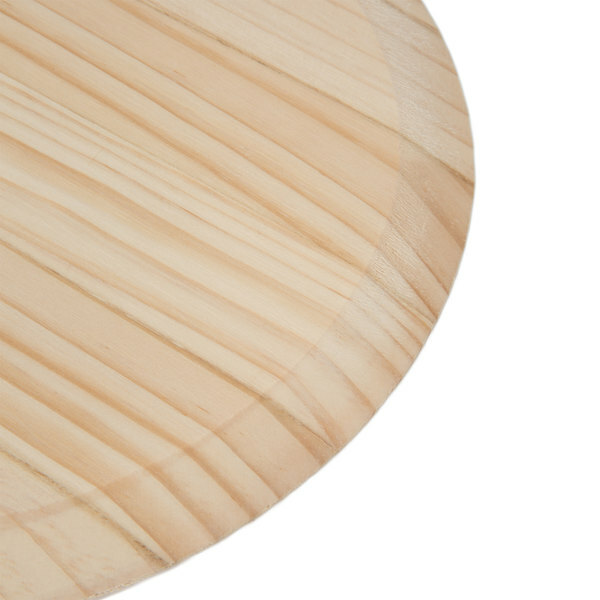 1/2" thick pine wood keeps it light in hand and looks great too - your customers will love the rustic charm of the wooden peel as you slide their orders in and out of your pizza oven! The blade on this peel allows you to accommodate pies that are smaller in size, making it great for shops that sell a lot of personal size pizzas and individual slices. This saves you time and helps you balance the pizza when loading and unloading. The short, 8" handle on this peel makes it easy for you and your staff to safely load and remove pizzas, providing maximum control in smaller kitchens while also keeping your hands back from the heat of the oven. 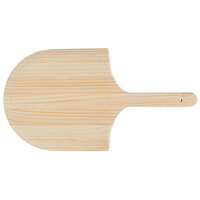 Its wooden handle is also comfortable to hold. How can I properly care for this pizza peel? Hand wash with a soft cloth and dry thoroughly. To seal, wipe with food safe oil, like mineral oil, on the surface of the peel. Do not expose the peel to a dishwasher, abrasive sponges, caustic cleaners, or acidic detergents. Never allow the peel to be soaked in water. Avoid leaving the peel on hot surfaces as this increases the chance of warping. If the peel warps, leave overnight with the warp facing up and it should flatten. 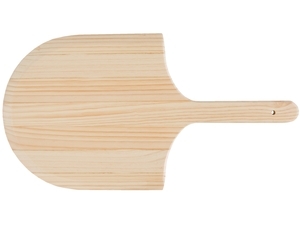 Great wooden pizza peel. 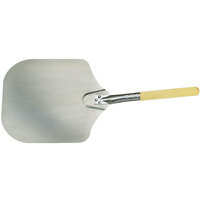 The small handle takes up less room on our counters and easy to clean with a damp washcloth or dough scraper. Awesome pizza peel. Super sturdy and durable for the price. Don't let the price fool you. 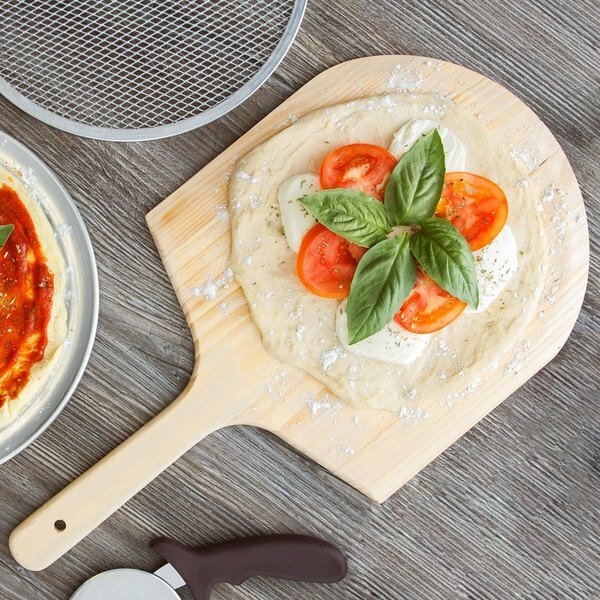 The 12x14 measures exact and is great for making pizzas on. Pizza slides over super nice and doesn't stick to the peel. Def recommend! So far these have worked great! Very smooth surface so the pizzas slide off easily. We will be ordering more as the business needs grow. We have about a dozen of these, as the price can't be beat. We use a rack and stack pizzas for days and cook them fast and hot. Great peel. I use these every day and don't have a problem. Quick scrape and a quick scrub in the dish tank and they are good to go. Need to dry directly after wash or they will warp. I am really surprised at the quality of this pizza peel. Really sturdy, smooth and made quite well. Impressed with how nice it is - highly recommend. We use these daily to build our pizzas on and to transfer them to the oven. They are holding up well after a year of use. The only advice is have is to never let them get too wet. very good quality. perfect for any pizzeria and size. on the pic seems that quality will not be good but once it arrvied it exceeded my expecation. Fantastic! Just what we needed to move our gluten-free pizza dough from pan to our product packaging. Indispensable product for our bakery. We will be ordering these again. Works great in our double decker pizza oven. The tapered edge helps to get the pizzas out with ease off of our stones in the oven. Works perfectly! The dough doesn't stick to the wood and slides off nicely. Wood is heavy duty and feels like it will last a long time. High quality product and it does feel solid. The wood has a beautiful grain and in order to maintain it in its original state I suggest to apply a coat of mineral oil or butcher block oil every once in a while, it will make it a little darker and nicer color and help keep it sanitized. I avoid using it to take the pizza out from the oven as I have a metallic peel. 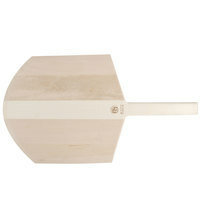 Great wooden pizza peel! Excellent quality and price. Works perfectly for loading and unloading pizzas in our oven, and can even be used as a cutting board. Our restaurants have been using this product for many years. This item is a solid, commercial quality product at a very fair price. Great product ! Wood is sanded very smooth and the pizza peel is very well balanced. Even after months of constant use, this is still in service! We love it. This cutting board is the perfect size to transfer my pizza from my prep area to a hot stone. It’s lightweight and easy to handle. 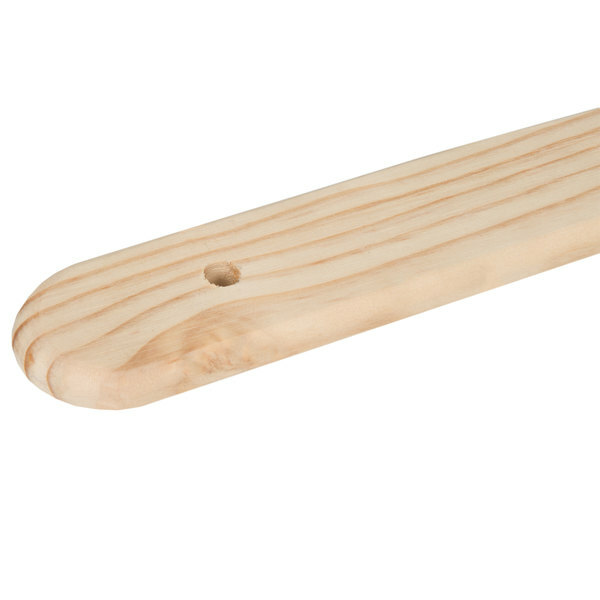 There’s a hole that you can use to store it hanging up on your kitchen wall instead of it taking up room in a cupboard. I plan on purchasing the wood elixir to season it before use just so clean up and sanitation are easier. Good sized pizza peel for large sized pizza. Fits well in our small oven. The handle leaves no extra room. If I needed to put it in a larger oven, I'd get a longer handle. Works great and has a thin taper on both sides so its reversible. This one is the perfect size. It fits large, medium, and small pizzas and other items too. Put a bit of corn meal on the peel so nothing will stick as you're sliding it off onto the pizza stone. My guests were so impressed when I brought pizza fresh from the oven to the table on this 12" x 14" Pizza Peel. The size is perfect to use with a 15" stone. 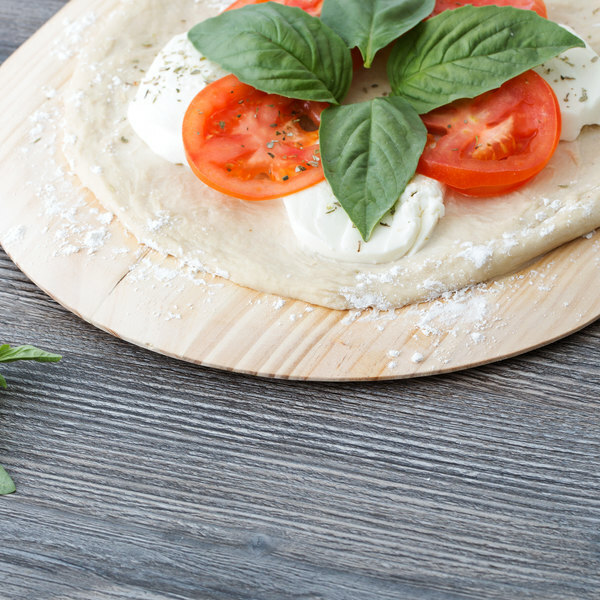 I assemble the pizza on parchment paper in advance and when the stone is ready, I just slide the parchment on the peel and load it on the stone. The peel is very light and the handle is long enough to prevent burning your fingers in the oven but short enough to make storage easy.